I've had a few emails from readers asking how to get the most out of the clothing budget. I decided to put together series of posts on what I thought would be helpful to others in terms of what to wear when you’re expecting. Of course, I'm still figuring things out so any thoughts and suggestions are welcome! I hardly wear blazers to work since my work environment is business casual. However, a blazer is a great way to add instant style to any outfit. With that in mind, I’ve been wearing casual dresses to work but throw on a boyfriend blazer to make my casual apparel more formal. 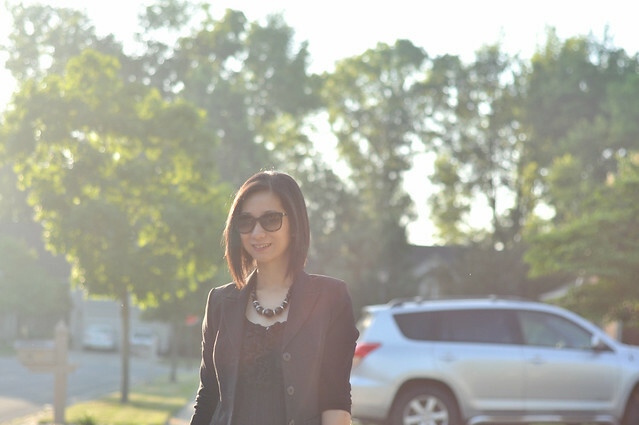 For this particular outfit, I simply added a classic black blazer, a pair of black pumps and a statement necklace. Voila! I am all set. This is a comfortable but still presentable outfit for me. To keep the cost of your maternity clothes down, buy items that will grow with you, such as stretchy and expandable waistline pants and skirts. Those simple and plain pieces are the best buys. 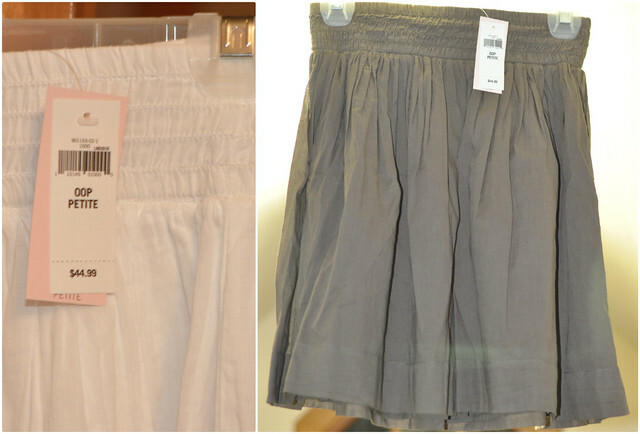 I picked up this skirt from the Banana Republic Factory Store last weekend in both colors and couldn't be happier. The elastic band makes this skirt a good transition piece. Solids are easier to mix and match than prints and are less memorable. You look phenomenal here, Sydney! I hope I look half as cute as you when I'm pregnant (someday!). I can hardly tell your preggo! Great tip to add blazer, as long as you don't gain too much width in the shoulders. I retained a lot of water up there! You looking fab! You still look fantastic. Cannot tell you are pregnant. Beautiful outfits, as always. You look amazing here. I can't tell that you're pregnant. I hope I can looks as good you when I'm pregnant. You look fabulous! Love this outfit and you can totally not tell you are pregnant!! When I was pregnant, I loved flowy dresses with an empire waist. During my third trimester, I started to wear shirts with ruching on both sides. For both of my pregnancies, I was due during the winter so bottoms were usually maternity jeans or maternity trousers. You look great for 23 weeks!